Anyone who gains any level of notoriety online receives their fair share of haters. By this I mean people who irrationally hate you. Jake Tompkins is one such person. He is an Anarcho-Communist who has dedicated a significant amount of time and effort attacking me on the most spurious of grounds, engaging in personal attacks and resorting to racism. This here will be a full documentation of out last exchange given his petty behaviour. I was made aware of a post made by Jake Tompkins about Maoism on DeviantArt. As one may expect it displays on his ignorance of Marxism and the theoretical weakness of Anarchists.Unfortunately I was unable to post this reply to his account as the system kept thinking it was spam. Maoism is not a “strain”, it’s a contribution to Marxism-Leninism. You fall on your face at the start. #1: The point of New Democracy is to build the material conditions to create socialism. Saying those material conditions need to exist in order for socialism to work is essentially just repeating what New Democracy says and then claiming it is wrong. There are real criticisms of New Democracy to make which he doesn’t. #2: “The most important divide is the divide between contradictions among the masses and contradictions between the masses and their enemies. Also the socialist institutions are plagued with contradictions […]”. Both Mao and Stalin acknowledged that, which he would know had he actually read any of their work. Try reading “On Contradiction” by Mao where he essentially lays out the difference between an antagonistic and non-antagonistic contradiction, the ones between groups in the masses, and the ones between the masses and the enemies of the masses. He literally has no idea what he’s talking about. #3: Three Worlds is not an essential part of Maoism, in fact Maoists don’t even use 3 Worlds Theory. It’s not a “weak point” of Maoism as Maoists don’t use it or accept it as a part of the theoretical contribution of Maoism. Finally he proves his utter ignorance of class struggle theory, “[…]no one has not received the benefits of imperialist social relations” Please tell me more of the $1 dollar a day surviving people in sweatshops that “benefit” from imperialism. By his logic if Third World people benefit from imperialism, then he’s claiming that a rising tide lifts all boats”. By this logic he has just given, third worlders being beneficiaries of imperialism,he has gone full Trotskyist. Jake does not know what he is talking about. This I find hilarious. Yes it is a contribution to Leninism, but it is not just a contribution. The contribution of Maoism takes the form of a specific school of Leninist thought. This is why it is called Marxism-Leninism-Moaism. It can not be likened to say Lenin’s theory on imperialism as the monopoly stage of capitalism that does not produce a new school of Leninism because it does produce a new school. This “reply” doesn’t make any sense. While finally admitting that that Maoism is a contribution to Marxist theory he says it’s a ” form of a specific school of Leninist thought.” So now there’s several schools of Leninist thought? No, there’s just Leninism. So in an effort to defend his blithering ignorance of Maoism he’s now claimed there are several “schools” of Leninism. Of course as usual he’s only made an assertion not backed it up. Anarcho-Capitalism is now a school of anarchism because someone has arbitrarily decided it was. New democracy claims that specifically in backward countries as oppose to ones that are not backward there is a need to develop materiel conditions before we can have socialism. It’s not just the claim that generally there is a need for materiel conditions to improve in order to have socialism. And? How does this actually refute what I said? Just giving the definition of New Democracy doesn’t answer my response to him. His claim, was that capitalism has to exist before socialism does, I answered with New Democracy that is supposed to bridge that gap. He responds by repeating the definition of New Democracy, what is that supposed to mean? He isn’t making any sense. Lol He just basically ignores what I said and blathers on about Stalin and Mao. My criticism was not on what theorists drummed up this part of Maoism rather it was noting that this particular part of Maoism pre-supposed class struggle under socialism which was incorrect. A this moment he essentially just pretends I didn’t answer him. 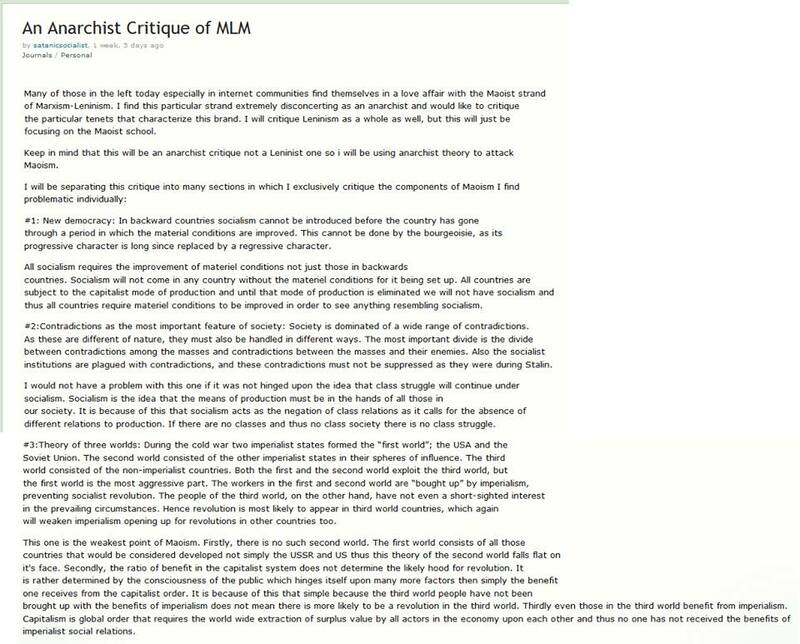 His original statement contained the accusation that MLM communism doesn’t take into account. He’s claiming that the state is a class and Stalin and others brutally suppressed people to keep the state form being abolished by claiming they didn’t take socialism into account . He’s also going by the presupposition that socialism is an automatic and instant jump to a stateless society, which it isn’t. More importantly, that doesn’t work. The basis of his argument is that Stalin ignored class struggle, which he didn’t. Neither in substance, nor in form. My point was to show that this was not the case by further giving the example that Mao did acknowledge that class struggle continued during socialism. This was just an angry response by him. I have heard of Maoist groups rejecting Three Worlds theory, but it is a tenant of Maoism and thus part of the philosophy and analysis. Three World’s Theory is not an essential part of Maoism which he is falsely claiming. It was not used in the Revolutionary War in China, nor was it used in the founding of socialism in China. It wasn’t used in any other Maoist revolution either. It isn’t even acknowledged as valid by almost all Maoist parties. Despite this fact, he claims it’s an “essential part”. Reality entirely contradicts what he’s claiming here. That’s like claiming a GPS system is essential to a car while ignoring it had nothing to do with the construction of cars, their design, or their proliferation. Jake has no idea what he’s talking about. How can Three World’s Theory “thus part of the philosophy and analysis” be a tenant of Maoist analysis when it the Soviet Union literally doesn’t exist anymore? Clearly it isn’t being used. Nor is it central to Maoism when the idea hadn’t even been invented yet. K, so you don’t know what Trotskyism is and your just throwing it out because you wanna delegitimize the oppositions point of view and you didn’t even read the whole thing because I said third worlders benefit from imperialism. The capitalist mode of production is based on hegemonic control of people by others from foreign lands. Third worlders benefit from the capitalist mode of production born out of imperialism by selling their labor power for wages to capitalists and thus benefit from imperialism. Also, the thing about the rising tide is a complete fabrication. Never said anything close to that. If he actually thinks I said this he prolly mistook descriptions of the flow of values in capitalist society that are part of Marxists theory for “A rising tide lifts all sails.” which given his understanding of theory I would not be surprised by. I also love how this guy has said he is supposedly not associating with me and then responding to directly to me on multiple online forums. “The capitalist mode of production is based on hegemonic control of people by others from foreign lands. Third worlders benefit from the capitalist mode of production born out of imperialism by selling their labor power for wages to capitalists and thus benefit from imperialism.” Actually this would be imperialism, but yes essentially correct. The claim that they benefit is a Trotskyist claim, it is false, as it literally ignores the fact that it requires the destruction of local production (capitalist or not) and the suppression of the development of it for the benefit of the capitalist class in another country. This does not benefit Third World workers, in fact it kills their ability to exercise self-determination by making them economically dependent. This is a bad thing. Jake is pre-supposing this Trotskyist position to be socialism when it is not. “Also, the thing about the rising tide is a complete fabrication.” I never said you said that, this is a analogy for the Trotksyist conception of what he just described. I didn’t confuse this saying with the socialist one “A rising tide lifts all sails,” I’m using a capitalist expression which justifies trickledown economics because I think it’s applicable here. However I do understand why there would be a misunderstanding over the expression. Not that it’s relevant to the argument being made. My actual point was the transfer of value from the Third World to the First World, which makes First World workers over paid and beneficiaries of imperialism, which he entirely ignores. Finally he concludes with personal drama which has nothing to do with the arguments presented: “I also love how this guy has said he is supposedly not associating with me and then responding to directly to me on multiple online forums.” By “multiple”, he means three. When someone keeps attacking you, which he has, but not in the case of the Anarchist critique of MLM, you do end up responding. It’s also important to note that since he brought it up that it was him who blocked me. After harassing me after unblocking me, I had to block him. Since he wishes to make it personal I’ll remind him of his creation of racist Facebook pages to attack me because I corrected him on a few points about Stalin. Jake, you’re a dishonest little attention needy troll who frequents my own videos to leave personal attacks. Jake has shown he has no idea what he’s doing, he’s dishonest and childish. Try as he might, he has consistently failed to keep a coherent argument and understand what my replies to him have been. I wish that he should not bother me again.